It's been a shattering year for seventeen-year-old Zoe, who's still reeling from her father's shockingly sudden death in a caving accident and her neighbors' mysterious disappearance from their own home. 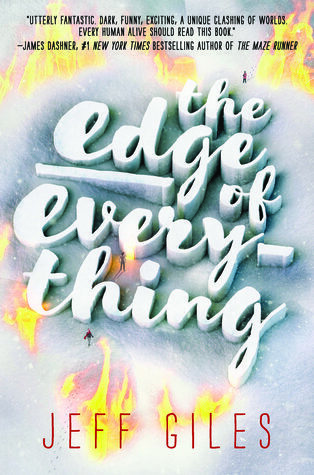 Then on a terrifying sub-zero, blizzardy night in Montana, she and her brother are brutally attacked in a cabin in the woods--only to be rescued by a mysterious bounty hunter they call X.
I was super excited to find The Edge of Everything on my doorstep one afternoon. I had seen the book cover around quite a bit, and I was super curious to see what the story was about. While it wasn't at all what I expected, I found it to be an interesting read. The two main characters in the story were Zoe and X. I love that Zoe was kind of snarky and sarcastic, and her fierce love and need to protect her brother was awesome. X had a sense of innocence about him that was adorable, especially considering he was basically born and raised in hell. Together they made a nice pair, and the romance between the two was cute at first, but then moved towards insta-love, and it felt a bit rushed. There are some interesting secondary characters in the story as well, some I hope we learn a lot more of in the next book. As I said above, the storyline for the book was not at all what I expected. For some reason I thought the book was a contemporary novel, but it definitely more of a fantasy instead. (This is my fault, as I should have read the summary a little better before starting the book.) There were quite a few twists and turns as the story went along that kept me turning the pages, and I was left with more than a few questions after I closed the book. Hopefully we will see answers to those in book two. Overall; while the storyline was not at all what I expected, I found The Edge of Everything to be an entertaining read, and I'm curious to see what's going to happen next for Zoe, X, and the rest of the crew. I am really excited to read this one, and even preordered it. I didn't realize that it would be part of a series, though...which upsets me a little. I hate open ended books! Glad you enjoyed it, even though you were expecting something different!